Sulfurous molecules on alien worlds might be a way to reveal whether or not those distant planets host life, MIT researchers suggest. Jupiter's monn, Io, for example, has over 400 active volcanoes, and is the most geologically active object in the Solar System. Some of Io's volcanoes can shoot plumes as much as 180 miles high into the air, and it's lava can flow as far as 300 miles. 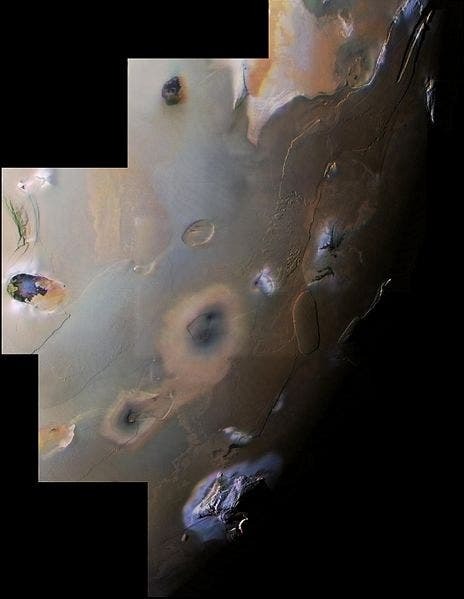 All the sulfurous volcanoes are responsible for painting Io's surface with different shades of yellow, red, white, black, and green (image left). Microbes can live off the energy available in sulfurous molecules that volcanoes release, essentially "breathing" these compounds the way humans breathe oxygen. If a similar kind of metabolism evolved on an extrasolar planet, the sulfurous molecules detected in the atmosphere of that world might help reveal the presence of alien life, said researcher Renyu Hu, a doctoral student in planetary science at MIT. To see what telltale signs any sulfur-dependent life might generate, Hu and his colleagues modeled Earth-sized planets in the habitable zones of sun-like stars — that is, areas where worlds could have liquid water on their surfaces. These simulated planets possessed nitrogen-based atmospheres like Earth but 1,000 times more sulfur. Sulfur-dependent life on Earth releases hydrogen sulfide as waste. The researchers found these microbes could increase hydrogen sulfide levels by nearly 10 times what they would be on a planet without such life. From interstellar distances, it would be hard to distinguish hydrogen sulfide (H2S) from water (H2O) on the surfaces of exoplanets. However, the researchers calculate that extra atmospheric hydrogen sulfide would in turn cause more pure sulfur aerosols to form in the air, which astronomers could detect based on their distinctive spectra or fingerprint in the visible and infrared wavelengths. "Hydrogen sulfide emissions from the surface would have a large impact on the atmospheric composition of a planet," Hu said. No Earth-sized planets have been discovered yet in the habitable zones of sun-like stars. "Characterization of the atmospheres of exoplanets has been confined to close-in planets so far," Hu said. Hu cautioned that hydrogen sulfide is not a conclusive signature of life. "We need to test our assumptions thoroughly," he said. "It may be, for instance, that volcanism could produce tremendous amounts of that gas." "We want to study as many as possible — look at many, many gases in Earth's atmosphere and see if they can be biosignatures as well," Hu said.